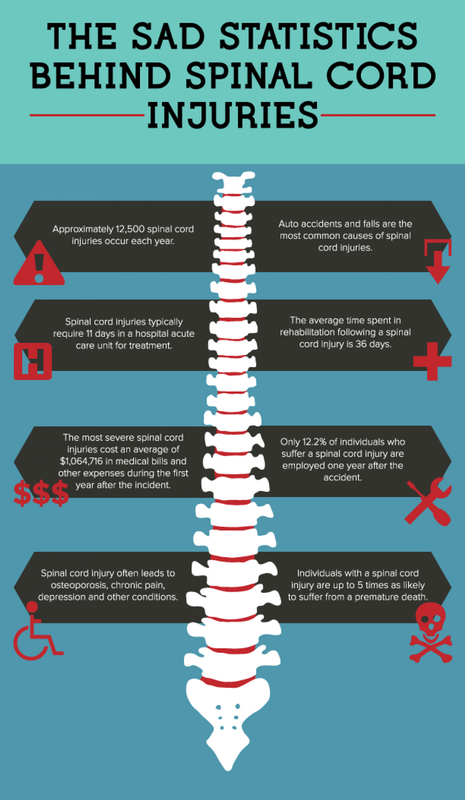 Spinal cord injuries can lead to a lifetime of financial strain, physical limitations, and mental pain and suffering. We bring over 180 years of experience in helping accident victims recover their deserved compensation. Our spinal cords are essential to all major bodily functions. They are also extremely fragile. Each year, approximately 12,000 individuals seek medical treatment for spinal cord injuries (SCI); and according to Johns Hopkins, there are currently over 250,000 people in the United States living with some form of SCI. There are many different forms of SCI, all with their own unique symptoms, treatment options, and long-term effects. In many cases, spinal cord injuries result from accidents in which someone other than the victim is to blame. Careless drivers, negligent property owners, and large corporations are routinely to blame for life-changing spinal cord injuries. If someone else is to blame for your injury, you deserve to receive just compensation. The effects of a traumatic spinal cord injury can touch all aspects of your life. The long-term medical expenses associated with treating a spinal cord injury can be unimaginable, and they are likely to reflect only a portion of the financial compensation to which you are entitled. Loss of earning capacity, pain and suffering, and other losses can be recovered as well, and these losses can far surpass the exorbitant costs of medical treatment for SCI. At Rue & Ziffra Law Offices, we are “Your Local Attorneys” for personal injury claims in Volusia and Flagler Counties. We have maintained a local practice since 1976, and our team of nine attorneys has over 180 years of collective experience. If you or a family member has suffered a spinal cord injury in a car crash or other accident, we are here to help you. We will explain your rights in language you can understand; and if you choose to hire us for your spinal cord injury claim, we will use our experience to fight for maximum compensation. Cervical Region – The cervical region is the uppermost portion of the spinal cord. It consists of eight vertebrae identified as C1 through C8. The cervical region is where the brain connects to the spinal cord, and where the neck connects to the back. Thoracic Region – The thoracic region is in the middle of the back and consists of 12 vertebrae identified as T1 through T12. Lumbar Region – The lumbar region is in the lower back and provides the connection between the spine, hips, and legs. It consists of five vertebrae, labeled L1 through L5. Sacral Region – The sacral region is located in the pelvis. Injuries to the sacral region can impact the lower body, including the pelvic organs, thighs, and buttocks. Spinal cord injuries in all regions of the spine can be classified as either “complete” or “incomplete.” A complete spinal cord injury results in total loss of function below the level of the injury. A patient with a complete spinal cord injury will lose sensation and mobility below the damaged vertebrae, and the loss of function will be equal on both sides of the body. An incomplete spinal cord injury is one that results in partial loss of functionality. This could mean retaining partial sensation or mobility (or both) or retaining functionality on the left or right side. Herniated (or Bulging) Disc – A herniated disc is a spinal cord injury that occurs when a disc (discs provide the cushion between the spine vertebrae) suffers damage due to a traumatic impact. Also referred to as a bulging disc, these injuries can cause arm or leg pain (depending on the region in which they occur), numbness, tingling, and muscle weakness. Ruptured Disc – Severely-damaged discs can rupture, causing spinal fluid to leak out of the disc and damage the surrounding nerves. Paralysis – Severe damage to the vertebrae and discs can lead to paralysis. Paralysis can affect all four limbs (quadriplegia), three limbs (triplegia), or two (paraplegia). Severe spinal cord injuries can cause loss of organ function as well. Generally, the higher the level of the injury, the more severe the potential consequences will be. Spinal Cord Abscess – Swelling, inflammation, and the collection of infected material in or around the spinal cord. These abscesses can be caused by an infection due to bacteria. But Injuries and trauma can increase your risk. Though spinal cord abscess is rare when they do occur they can be life-threatening. If you have been diagnosed with a spinal cord injury due to an accident caused by someone else’s negligence, you are entitled to seek full financial compensation for all of your injury-related losses. This includes financial losses (such as medical expenses and lost earning capacity) and non-financial losses (such as pain and suffering, emotional distress, and loss of enjoyment of life). Even if no one else was to blame for what happened, you may still be entitled to compensation in the form of workers’ compensation, long-term disability, or Social Security Disability (SSD) benefits. Workers’ compensation provides medical and income benefits for job-related injuries, while long-term disability and SSD cover both job-related and non-job-related injuries. Q: What are potential treatment options for spinal cord injuries? The treatment options for spinal cord injuries depend upon the location and extent of the harm caused. In many cases, surgery will be required – which may or may not allow for a total recovery. Non-steroidal anti-inflammatory drugs (NSAIDS), steroid injections, physical therapy, and other treatment options can be used to treat the symptoms of spinal cord injuries as well. Your doctor will prescribe a treatment plan that provides the greatest recovery potential for your particular injury. Q: What types of rehabilitation are required for traumatic spinal cord injuries? Q: How can a lawyer help with my spinal cord injury? There are a number of ways that our attorneys can help with your spinal cord injury. First, if you need help finding expert medical care in Volusia or Flagler County, we can refer you to a trusted physician. Second, we can help you seek just compensation for the immediate and long-term costs of your injury. Whether that means filing a personal injury claim, a workers’ compensation claim, or an application for long-term disability or SSD benefits – we can make sure that you explore all available options for maximizing your financial recovery. At Rue & Ziffra Law Offices, we are here to assist in any way we can. Our attorneys and professional staff members are passionate about helping our clients with all aspects of their injury claims, from scheduling doctors’ appointments to fighting for just compensation. With nine office locations in Volusia and Flagler Counties, we are in your community, and we are on your side. To speak with someone who can help, please get in touch today. If you would like more information about how we can help with your spinal cord injury, please contact us to schedule a free, no-obligation consultation. You can reach us 24/7, so call (386) 788-7700 or send us your information online now.